Outside My Window…the sun is shining and the trucks are buzzing by at 20 miles over the speed limit. I am thinking…about the painting I need to finish for the book and the new wbsite and how to make some more money for our upcoming vacation. I am thankful for…good friends who are willing to listen to me ramble on about a new website I am working on and all the stuff I am doing and help me get focused on the important stuff. I am wearing…boys cargo shorts and my current favorite t-shirt. I am creating…another page for the bunny book and the logo and sidebar stuff for a new website. I am going…nowhere, I hope. I don’t want to leave the house today though I hear the library calling my name. I am reading…an old favorite: Thornyhold by Mary Stewart. I have always loved Mary Stewart and this book is one I have read a zillion times and still reread because I can read a bit and walk away with all my favorite bits still in my head. I am hoping…to get the site theme done and start organizing material for the new website, to send out an email getting a feel for possible interest in a local art class, getting the laundry done and the kitchen clean, and a zillion other things that aren’t likely to happen.. I am hearing…WOW–my husband is playing right behind me and his character is fighting some big monster. Around the house…the kids are playing computer/video games and my son is nagging me to attack the basement bathroom. One of my favorite things…is God’s perfect timing in everything–it is so wonderful and amazing and breathtaking. A Few Plans For The Rest Of The Week:work on the basement, go to the library, go to the pond, finish several paintings, finish the new website theme and start writing posts. 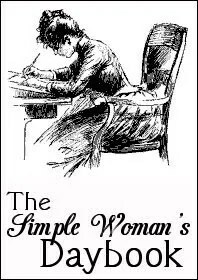 I found your site through the Simple Woman’s Daybook. I really like your graphics and web site designs! Loved reading your daybook! Thanks for sharing! Thanks for sharing your daybook! I love the graphics on your website!